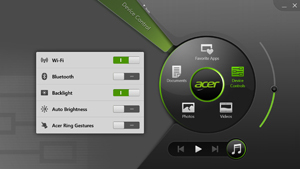 Acer Ring is a program that comes preinstalled on most Acer touchscreen devices that run on Windows 8. 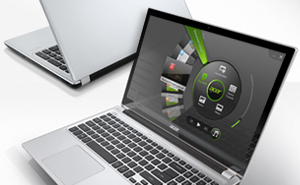 An Acer Ring icon will be visible on the Desktop screen of a device that has it installed. The program launches instantly and displays all of your favorite documents, videos, photos, apps and controls in one easy-to-use touch interface. You can launch Acer Ring by simply placing five fingers on your device's screen. The app launches instantly and is designed to let you tap and slide your way to your favorite tools, documents and media. It's always there, yet never in the way. It sits on the side of the screen for basic navigation and on the edges of the screen when you're viewing media or documents. With Acer Ring, everything you need is right at your fingertips, right away. Acer Ring lets you choose which documents, apps and media files it displays. It displays the content of six categories: Documents, Device Controls, Favorite Apps, Photos, Videos and Music (tap the music icon below the ring to find your music lists). You can select the apps and docs you want to place in the Favorite Apps and Document categories. 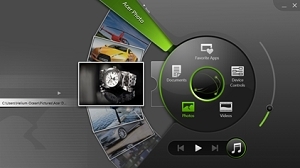 Acer Ring's three media viewers will display the content of the Pictures, Videos and Music subfolders of your Windows 8 Libraries folder. The Device Controls category displays a group of shortcuts to the setup menus of important tools like Wi-Fi®, Bluetooth®, the screen backlight, auto brightness and gesture control. The unique Acer Ring control interface makes touch navigation simple and natural. Use fluid touch gestures to quickly scroll through your media library and pick out a movie to watch, or flip through the pages of a document. Acer Ring uses impressive rendering technology that can operate at up to 60 frames per second, resulting in smooth transitions between photos and documents, as well as superb video experiences. Acer Ring imports documents easily and seamlessly. And, it can view all PDF, Word, PowerPoint, .txt and .epub files, even if you don't have the relevant software on your device. Acer Ring also has smart tools for drawing on your docs and for highlighting text. You can preserve the editing marks you made on a page by saving that page as an image. Plus, Acer Ring is optimized for scrolling through documents with your fingertips, and all controls are the same as they would be using the documents' original software. Finding your photos is now easier than ever. Simply tap the Photos icon on the Acer Ring to get a photo slider bar that gives you a visual way to quickly touch-scroll through all the photos in the Pictures subfolder of your Windows 8 Libraries folder. Photos are displayed as thumbnails, making them easy to identify immediately. 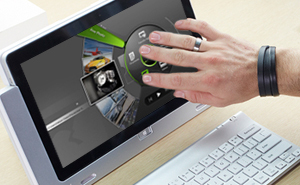 Just tap a photo thumbnail to open it in the Acer Ring touch-friendly media viewer. 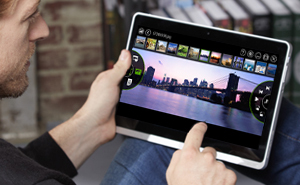 Once in media viewer mode, you can smoothly touch-slide from photo to photo -- it's as easy as that. Device Control gives you instant access to the control screen (including on/off buttons) for your device's Wi-Fi®, Bluetooth®, auto brightness and backlight. You can also switch your Acer Ring gestures on or off, depending on whether you want to use them to control actions while in Acer Ring. Acer Ring lets you add all the apps that you want to access quickly. 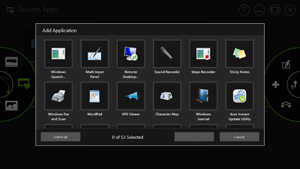 Add the apps you prefer by opening the program's Add Application screen and tapping the icons of those apps (the window will present you with an icon list of all the apps on your device). Now, when you launch Acer Ring and click on the Favorite Apps icon in the central ring, you'll see an icon slider with the icons of the apps you selected. Simply slide to the app icon you want and tap it to launch that app instantly. With Acer Ring, your favorite app is just a few taps away.